Eastbound and westbound I-94 traffic is maintained for travel through the interchange. 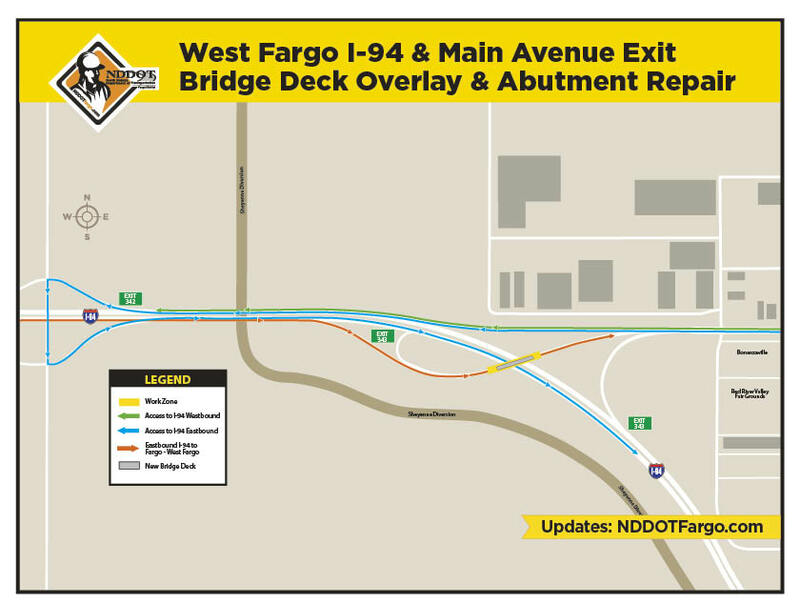 To complete the necessary bridge repairs, a detour route is in place for westbound Main Ave traffic wishing to go eastbound on I-94. 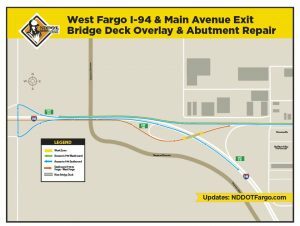 Main Avenue to eastbound I-94 traffic will instead be detoured to travel west on I-94 to Exit 342 (Raymond Interchange) and return east on I-94. The length of this detour is about 2.5 miles. The anticipated project schedule will suspend project work during the week-long Red River Valley Fair in July. Crews will open the bridge to allow two-way traffic if phase one is complete then work will commence on the final phase of the repairs. The west end of the bridge deck is deteriorating and delaminated. Crews will remove approximately 5 feet of the west end of the deck and replaced. The entire bridge deck will be milled and overlaid with new concrete. Project work will also repair the west abutment and the west approach slab. This project work will take four to five months to complete. Rear end crashes are the most common in work zones. Motorists are encouraged to slow down, allow extra distance between their vehicles and the vehicle in front of them, use caution and obey posted signs. The deck is delaminated. If left untreated, the bridge deck is susceptible to spalling, which is when the top layer of the deck concrete becomes loose. NDDOT has funded the entire bridge project with state and federal funds. Bridge project cost is $650,000.